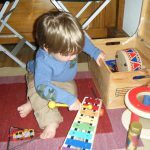 People often ask about the link between music and speech and language development. The answer to the question lies in neuroscience. Research has found that both language and music are processed in the left hemisphere and more specifically , the same areas of the brain are used to process both. The reason for this is clearly in the similarities of the brain functions needed to process both music and language. In order to process language and music, our brains have to interpret an acoustic signal, that is a series of sounds. This signal also has rhythm and intonation (rising and falling pitch) and all of the sounds are relevant to specific audible frequencies. Current research is looking at the comparison between the processing of sentence structure of language and musical phrases. So the link between music and language starts in the brain, and it actually starts before birth. In the womb, babies learn to tune into sounds that they hear which begins during the second trimester. Babies ability to attune to environmental sounds i.e. the noisy womb leads onto being able to perceive environmental sounds outside of the womb. Recent research has found that babies are able to recognise their mother’s voice once they are born and also voices of significant family members shortly after birth. They demonstrate keen preferences by responding more when they hear the familiar voice of their mother. As they grow they learn to differentiate speech sounds within the languages heard around them from about 6 months old and tune into them in order to learn to imitate words they hear. We know they need to hear word many many more times before they are able to say them which is why attention skills and understanding are fundamental to expressive language. But music helps with all of this. Children learn to differentiate sounds, patterns and rhythms so when we sing to babies, we are effectively filling their bank of sound learning with all the tones, rhythms, rhyming words and repetition. Singing can be so much fun for babies as they can learn to remember the pattern of words and melody and begin to anticipate it which helps them to learn better, and it is also great for promoting good fluency and rhythm in natural speech. As adults, we may still find learning through song is helpful for getting things to stick in our memory. It has also been found in research from Finland, that music helped train children’s listening skills for learning new languages. Children need to rely on the awareness of sounds that they have developed to this point to learn the sound rules of their native language so that they can discriminate between different vowel and consonant sounds and when and how they are used in words. This is called phonological awareness, and before children learn to recognise words and are able to break word into sounds around the age of 3, the foundation has already been laid by their attention to different speech sounds within their own language. This skill can also be helpful for children learning more languages as they need to differentiate separate sounds systems for each language. Then the task of breaking words into sounds can begin and children go through many stages of learning the rules of the English language and move through some typical error patterns as they do. There is more information on the ages and stages of speech and language development available here. When children learn to read, they rely on their underlying phonological awareness to help them decode the text into sounds and blend those sounds together to make the words. Children are often taught to tap out syllables to help them with reading as well as spelling, and this is useful likely because of the movement and rhythm involved. Studies have found that moving to a rhythm and involving movement within learning has an impact on overall language learning and this a correlation to the reading ability of the children in a recent study covered in the BBC News. Some of the elements of literacy which we often work on include rhyming and alliteration which help us become aware of the sounds at the beginning and ends of words. Some of my favourite books to use within therapy to help support these are written by the brilliant Dr. Seuss whose works include lots of examples of both of these examples as well as a lot of repetition and rhythm making them easy to memorise even for very small children. Sing nursery rhymes (with actions of course!) You can make your own actions based on acting out some of the ideas from the songs. Nothing is too silly, in fact the sillier the better. Read books together that have lots of rhyming words and repetition and rhythm like, We’re Going on a Bear Hunt or Green Eggs and Ham. Leave gaps for you child to fill in the blank. They will love it! Bang on things in a rhythm either along with music or without. You can use pots and kitchen utensils, real instruments or even make your own drums and shakers. Dance to a rhythm and make up your own moves to your favourite hit songs. The movie, “Trolls”, is a big hit in our house right now! It really helps to get your whole body moving and gets those happy juices flowing. Bring your children to music events of which there are loads around including free and paid events. Go along to one of the baby and toddler music and movement groups and classes which are usually very affordable and fun for all ages. We recently went to Hartbeeps with my youngest from about 3-9 months and found it so fun! There are many other musical groups and activities locally including Bach to Baby and Sing and Sign etc. You just need to choose an activity you all enjoy and give it all you’ve got!